Anyone that saws their own logs knows what they feel like when hitting steel. Blade is useless. Normally if you try to keep going you get crooked, crappy cuts. On this log, I finished the cut and realized that it stayed a straight cut. So I turned red neck and finished the log. Very slow with a really dull blade, but the blade did the entire log without wavering. It of course was retired after that log. You can punch the nails you see out, but I still won’t run them through a planer in case I missed something. So they were relegated to bench status with hand power planer and sanding. I left the nails in this one. They aren’t sticking up to catch anyone. Can I get suggestions if this is OK or wrong? The legs are poplar. It’s 34 inches tall, 66 inches long and 24 inches deep. I will finish the finish today. 7 coats of Spar Urethane. Here’s the replacement for the Elm bench that sold. Monte, I love most all of your projects, but this one is my favorite. Simple, yet eloquent…something to be proud of and should stand the test of time. Well done, friend. I would not take them out! As long as they are safe to you you will be fine. They help give the piece a story. Looks like the metal gave some color to the wood. My two cents. Great looking bench and that’s cool it’s to replace one that had sold for you! I didn’t think there was much you could do in woodworking that was wrong. There’s definitely some better and some worse methods, but creativity is a very flexible concept in my book. As long as it won’t catch on anyone sitting on the bench, I think it gives it a unique appearance. Great benches, Monte. You nailed it! Your saw does nails better than mine! I would leave em. Are those seats screwed into the end grain of the legs or? Need pics of the underside/attachment. Am I missing something? How did the nails get in there so deep? I like the staining they produce and would leave them. When you send me this next bunch of BKP, I’d prefer the nails shipped separately. Me too, Andy. Can’t figure how it’s done to stay solid and stable. I will take pictures of the next bench I build. Probably in the next couple days. These logs came from a home owner. Nails were pounded into it when it was young and it grew around them. The wood will shrink—the nails won’t. The nails add character…just so long as they don’t rust on someone’s favorite jeans. How is the State Fair progressing? Great I hope…! That is a keeper Monte. I think that the nails will be fine, once they are covered by the urethane finish. 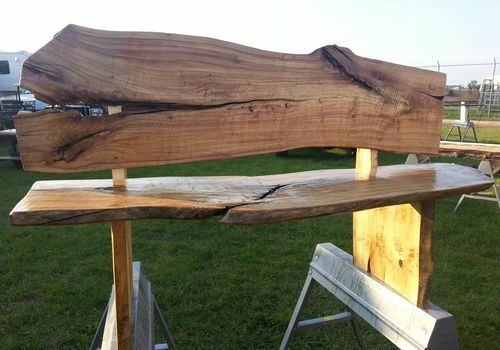 Somebody will have a beautiful, rustic looking bench. very nice Monte, my blade always stop cutting at all after hitting a nail. “so I turned redneck and finished the log.” Adaptable. Practical. Cat Poop fertilizer! You have a way of making things happen in a positive outcome. Nice save Monte.